The Sandman Hotel & Suites Winnipeg Airport is a 3½ star hotel located minutes away from the Winnipeg International Airport, Polo Park Shopping Centre and Assiniboine Park, and is approximately 10 minutes from Winnipeg's City Centre. Our Winnipeg Airport hotel boasts a variety of guestrooms and suites with a choice to fit everyone's requirements. 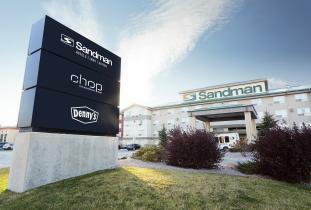 Denny's 24 hour on-site restaurant offers room service from 7am to 11pm and Chop Steakhouse & Lounge is open daily. An indoor swimming pool, whirlpool and fitness center are available for all exercise activities. Our Business Centre and guest rooms all feature high speed internet access, we also provide complimentary 24 hour shuttle service dedicated to and from the Winnipeg airport. The hotel also has a variety of meeting rooms available for business and or social functions with catering provided through CHOP.